OK so u know the winner of Project Runway (coming out in august!) from 2 seasons ago. CHRISTIAN SIRIANO! 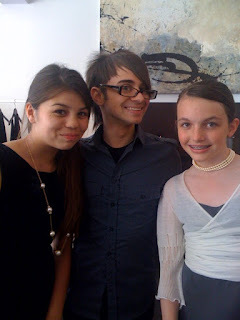 Well he was having a trunk show and our friend Sarah came with me. But anyways i met him and he was sooo nice!!!!! YUP SO here is a pic!!!!!!!! I met Santino Rice and the guy who won the third season, I forgot his name but Christian is WAY more awesome! The two people in the world I want to meet more than anything are Christian Siriano and Chris from that same season, I forgot his last name well anyways OMG!